The renovation of platforms, buildings, and the urban space around Nørreport, the busiest railway station in Denmark, has begun. The project is based on a proposal by Public Arkitekter in cooperation with COBE, Grontmij Carl Bro, and Bartenbach Lichtlabor, which won first prize at an international architectural competition. 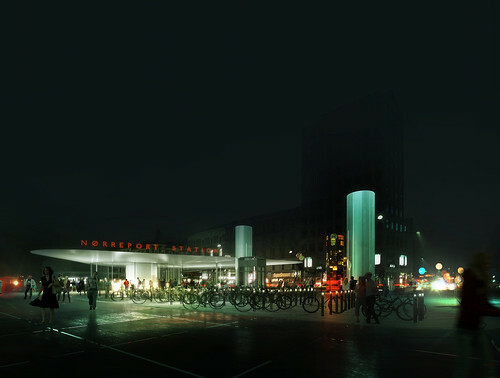 Every day, more than 250,000 people pass through Nørreport Station; improving the conditions for cyclists and pedestrians has been a must for the architects. All bikes will be placed in well-defined and slightly-lowered areas called “bicycle beds”, which will help create a clear and calm urban space. The bicycle beds will be strategically placed so cyclists can always find one from wherever they enter. The idea is to make it as easy as possible to park your bike on your way to the platforms – without unnecessary detours. Nørreport Station previously had space for around 900 bikes. After the renovation, there will be room for approximately 1,900. Placing the parked bicycles about 40 centimetres below the standard level of the station gives a good overview while securing functionality and accessibility. The change of level and pavement between the bicycle beds and the rest of the station will clearly mark where—and where not—to park your bike. 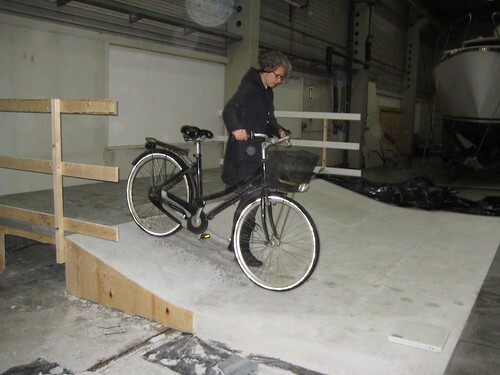 The bicycle beds themselves will be laid out in concrete with a non-skid surface, and the newly developed bike racks in stainless steel will be designed for tight angle parking in order to maximize capacity. Every rack will have built-in LED-lights on the top. The many small lights will clearly mark the bicycle beds, which will be made to look like organically shaped, shining islands in the city’s busiest urban space. Along Nørre Voldgade, all car and bus traffic will be gathered into two car and bus lanes passing Nørreport Station on only one side, a change from the current configuration. This will create a new, continuous plaza connected to the medieval city centre, and make room for urban life and bicycle parking in one the city’s busiest urban spaces. 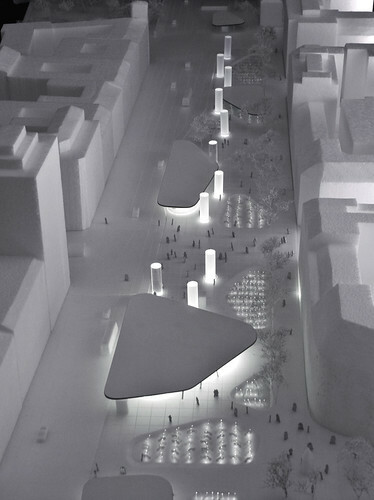 Light, transparency, and accessibility are key words for the new urban space. The architects have chosen to gather all the station’s functions under a number of light, almost floating, roofs. Thus, is will be possible to cross the plaza in every direction, and all facilities, stairs, and elevators will be visible and easily accessible. The few actual buildings under the light roofs will be constructed entirely from glass as transparent pavilions. This avoids bleak buildings, and the rounded shapes of the buildings are designed to make room for the expanding streams of passengers, pedestrians, and cyclists. The New Nørreport is scheduled to open at the end of 2014.